I really loved how it turned out so I decided to do a brief tutorial on it! Her version was somewhat scrappy, but this time I opted to use a number of prints from the same collection (Farmdale) and some coordinates. The runner finishes at 18"x36" This would make a great housewarming or wedding present since you can personalize what you say in the middle--I love the idea of putting a newly married couple's last name on it! a generous 1/2 yard for backing. The runner finishes at 18" so if your 1/2 is slightly larger, it will work. Remember, you're trying to cover about 18"x36"
Cut out your squares. 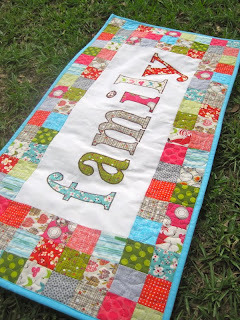 This would also be a great project for left over jelly roll strips, charm squares, or layer cake pieces! 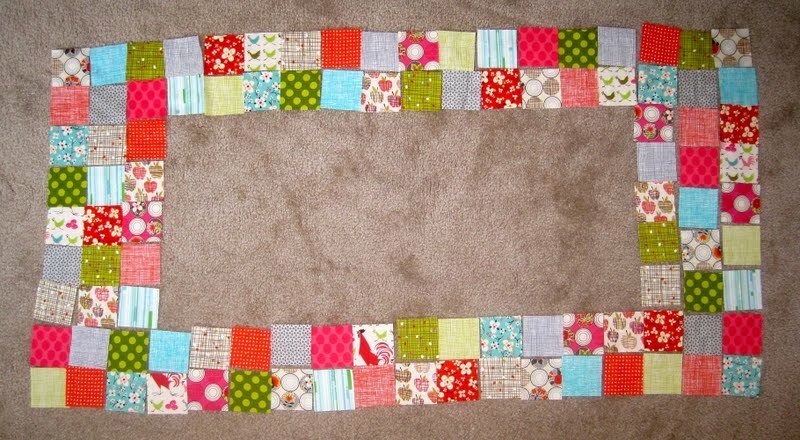 Sew together your rows of 9 squares. I'm only showing three, but you will have a total of six. 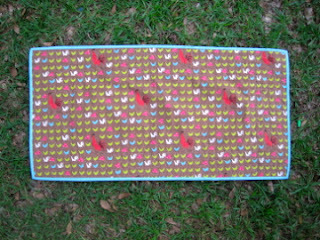 Press your seams however you like. Sometimes I press mine open, sometimes I use my brain and figure out which direction to press alternating rows. It's up to you! 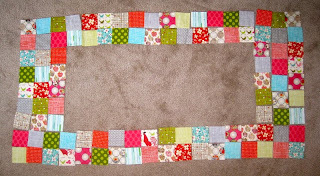 Sew the rows of 9 squares together into a rectangle--it should be 3 squares across by 9 down. You will have two of these. Sew four sets of 12 squares, two for the top, two for the bottom. You should end up with four sections. Trace out your letters onto the paper side of the Heat'nBond. You MUST make sure the letters are backward! I printed mine from Word using WordArt. I chose Georgia as my font and I made sure the letters were around 6" high--you may have to do each letter separately since if you put the entire word in (1) your 11" paper won't be long enough and (2) the 6" will be from the top of the highest letter to the bottom of the lowest so the letters in between, in this case "ami" will be shorter than the rest. I then took the print out and placed it under the Heat'nBond sheet and traced. Easy peasy! 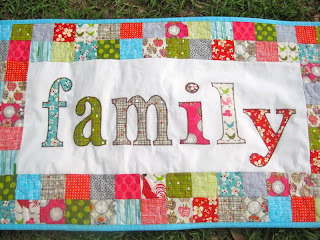 I then cut each letter out separately since I wanted to use different fabric for each letter. Follow the instructions on your fusible product. I ironed the letters onto the back side of the fabric I was using then cut them out. Arrange the letters so they are evenly spaced. I used my acrylic ruler to be sure the bottom of the letters was level. Applique the letters on. I may do a video tutorial on this later. I started to for this post, but my camera wasn't charged and I was too impatient to finish this project. ha ha! 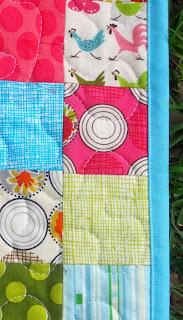 I used a zig zag stitch (stitch length 1 and width 3 on my machine), but you can use a blanket stitch or free motion near the edges like I did on my original version. Quilt and bind in your preferred method and you end up with something like this! I free motion quilted the patchwork areas and left the center free of quilting. I machine bound this using invisible thread. Sweet! 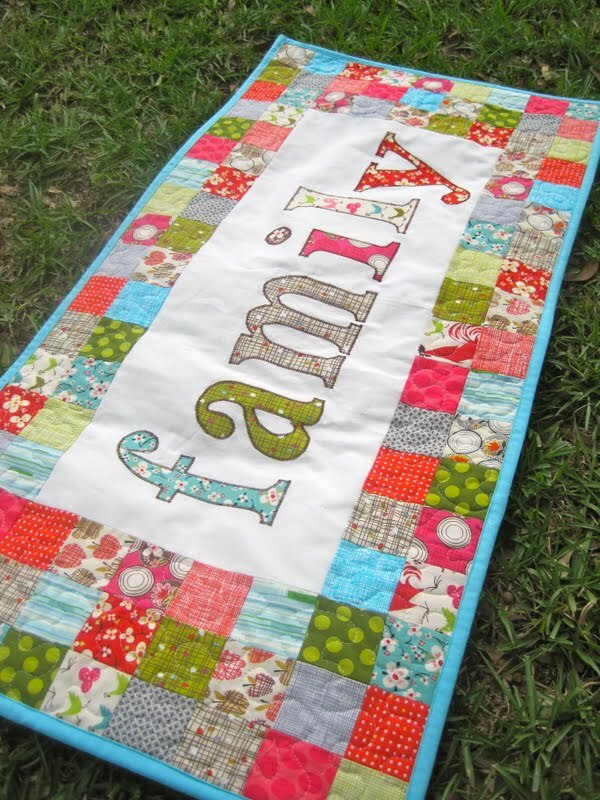 I could see adding a few more rows of patchwork and making it into a wall hanging! I love this!!! 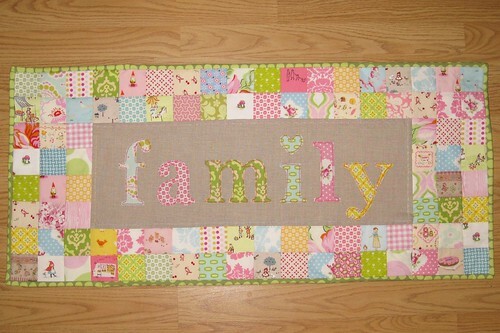 I am looking forward to making this for my new home. I shared your link on my blog. I think I may make one that says LOVE for Valentines too.